Who is Cincinnati’s Magical Entertainer, The Amazing Cindini? Thank you for your interest in Cincinnati's all occasion magical entertainment. The Amazing Cindini is a Professional Magician, Comedy Hypnotist, Mentalist, Fortune Teller, Magic teacher, Trainer and Motivator. Amazing Cindini performs magic for both children and adults. Interactive, fast-paced magic shows filled with laughter, mystery with lots of audience participation. She baffles audiences of all ages from 3-103! Cindini's magic shows include lots of audience participation and packed full of clean family fun. The Amazing Cindini has performed professionally since 1995 throughout the U.S., Europe and Asia. 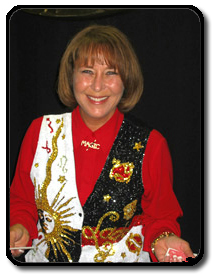 She is an active member of Society of American Magicians and a board member of the Cincinnati chapter of International Brotherhood of Magicians, Cincinnati chapter. Besides performing magic, Cindini has taught magic to thousands of students throughout Cincinnati and surrounding areas and operated a summer magic camp in Mason, Ohio for 10 years. ADD MAGICAL ENTERTAINMENT TO YOUR NEXT PARTY OR EVENT. All services can be tailored to fit your needs. Whether you're young or old, the magic will leave you in awe. Visit our Cincinnati corporate entertainment, children's family magic shows, and magic camp workshops for additional information about our custom-tailored magic to your next event or occasion.